I'm sure this has been brought up several times already, but this issue needs to be attended to in a serious manner. As you all know, reputation points are certain points that can be positive, negative, or neutral, and they are usually given to a user when he/she has done something that appealed to the reputation giver, in the case of a positive point, something that the reputation giver did not find good, in the case of a negative point, or something that the reputation giver found just fine or something, in the case of a neutral point. Neutral points are also handed out to users who are just "cool" to the reputation giver (or something like that). Ever since the introduction of the whole system of reputation points, I have picked up on many problems concerning the system. Firstly, some users have found a way to abuse the system, creating alternate accounts and using those alternate accounts to give their main account a large amount of positive reputation points. This makes the user seem to be a nice, reputable user when he/she may not be so. Next, some users have been giving staff members positive reputation points to "kiss up" to the staff member and so they could be the staff member's "best buddy." This is absolutely unacceptable as it just makes the whole system of giving users positive reputation points into a race to see how many staff members a user can get on his/her "side." However, it's not just the positive reputation points that are being abused. Negative reputation points are being used in inappropriate ways as well. For example, some users think that instead of talking to a user who may have angered them to solve the dispute they should just spam the user who angered them with negative reputation points as they feel fit. This is not appropriate at all, as it completely defeats the whole purpose of negative reputation points. Negative reputation points are to be used when a user has been posting posts of poor quality frequently, or when a user is acting in an inappropriate way on the forums. Giving a user negative reputation points just because he/she is "your enemy" or whatever is completely unacceptable. Seriously guys? This is not cool at all. 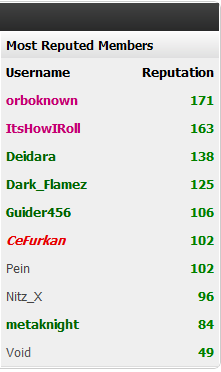 As you can see, more than half of the list is dominated by staff members, which shows that users are giving them reputation points just for the heck of it, not because they are necessarily good on the forums. There are clearly many issues with the current reputation system, and I do not foresee them being fixed anytime soon. Therefore, I believe that the whole system should be removed. It definitely is having a larger negative effect than positive on the community. Edit: Thanks orboknown for making a poll! I totally argee with you lamb, even as one of the highest reped members. there are real flaws and I think you represented them well. Like really... what do others do except spam for fun? If it's fun to them, let em do it. They aren't really harming at all. and rep can go get flushed away. I just noticed the staff member thingy. i saw it.i didnt really pay attention to it cuz rollie n nitz and flamez give alot of rep around. We can remove it... or.. we can reset every reputation point and make the repping system work on a certain IP and only once every 24 hours.. maybe? (2011-09-15, 06:47 PM)rock gyo Wrote: We can remove it... or.. we can reset every reputation point and make the repping system work on a certain IP and only once every 24 hours.. maybe? There is a limit to reputation a certain group members can give. Like regular members can give around.. 5 maybe. Cuz Super Mods can give around 9-10-11 reps idk. I gave like.. 11 in 1 day. Green mods can give around to 7 I think. Well.. the point is, is that there's a limitation to how many rep points can someone give in 24 hours. supermods can remove rep.but is it ok to do so if its spam or does it need to be hurtful/completely unnecesary? (2011-09-15, 06:52 PM)orboknown Wrote: supermods can remove rep.but is it ok to do so if its spam or does it need to be hurtful/completely unnecesary? What rep point isn't spam? ._. eh.ive given rep cuz the post actually has a good point. should we only be able to give rep via posts? that would work..how about only so many rep points per ip address? (2011-09-15, 06:57 PM)orboknown Wrote: eh.ive given rep cuz the post actually has a good point. Agree but then that could be abused. 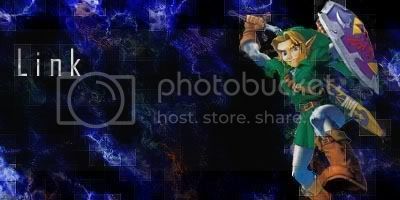 (2011-09-15, 06:58 PM)orboknown Wrote: that would work..how about only so many rep points per ip address? @rollie that wouldnt solve the multi account rep spamming. the ip address bit might. also dont put it on the left in main page as it will seem like a competition to some and they might take it serious. I'd love for us to judge those based on how long they have been online. that would be better. i would be too..mainly all the mods lol.